On MeTv, there is a horror host from chicago, his name is Svengoolie, also known as Rich Koz. He was part of the WCIU television station in the area known as Berwyn. He first started as the Son of Svengoolie in 1979 after Joey G. Bishop retired the character in 1973. Then, after the cancellation of the Son of Svengoolie in 1986, Rich Koz kept on going with the Koz Zone from 1986 to 1995. In 1995, Koz finally attributed the title of Svengoolie. He is currently one of the last remaining horror hosts from the golden age of television to continue his stance on television. He currently screens horror movies from Universal as well as monster movies from Toho Studios. To learn more about Svengoolie, visit svengoolie.com. If you are in for comedy and terror, then tune in this Saturday at 10/9 central for Abbott and Costello Meet the Killer, Boris Karloff from 1949, from Universal Pictures. Combining two comedic icons against the king of horror from Universal. One of the movies that Svengoolie screened last year was a Steven Spielberg film that had not played on television for years, Duel (1971) starring Dennis Weaver. I haven't seen the film, but I heard it was a ratings grabber. I love this movie. It's very suspenseful and keeps you on the edge of your seat. Dennis Weaver is very believable. I hope you get to see this sometime. I'm fortuante enough to have a DVD of it. This Saturday, Svengoolie will be presenting The Mummy's Tomb (1940) a sort of loose remake/sequel to The Mummy starring Boris Karloff. Be sure to tune in tomorrow at 10/9 central on MeTv. Tomorrow on Svengoolie, they will be presenting This Island Earth (1955) with Rex Reason and Faith Domargue. It's all on Svengoolie, at 10:00 in the evening on MeTv. This Saturday on Svengoolie, Bud Abbott and Lou Costello are separated from each other. One is alive, and the other is a ghost that is forced to haunt a mansion that survived the Revolutionary War for more than 100 years. It's The Time of their Lives (1946). Watch it on Saturday at 10:00 pm on MeTv. Exciting News: Horror Fans! Svengoolie is moving his time from 10:00 to 8:00 on Saturday September 9 on MeTV. And be sure to watch Boris Karloff and Bela Lugosi in their final pairing at Universal: The Invisible Ray (1936), it's a must-see for those that are into sic-fi horror. For those of you who have not been watching Svengoolie they were playing the hit song that made its debut last year with the airing of The Frozen Ghost (1946) starring Lon Chaney Jr., The Svengoolie Stomp. The video is right below if you want to watch it. Hope you enjoy The Svengoolie Stomp. Be sure to watch Bela Lugosi in the Universal Studio production of Murders in the Rue Morgue (1932). A pre-code classic that is based on the short story by Edgar Allan Poe. What is the TCM Spotlight for the month of October going to be about? I just want to know. This Saturday, A college professor mixes up ancient fossil DNA with his own and becomes "The Monster on the Campus (1958)". Don't miss it on Svengoolie. Saturday night at 8/7c on MeTV. Trailblazing Women on Monday nights, and Classic Horror on Tuesday nights. This Saturday on Svengoolie. 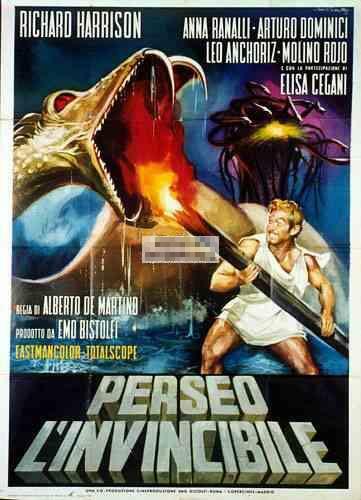 It's the television premiere of "Medusa Against the Sea of Hercules" (1963) from Italy at a new time 8:00/7:00c on MeTV. That's Medusa Against the Son of Hercules. It has also been released as Perseus Against the Monsters, as the story is actually that of Perseus and Andromeda. Next Saturday on Svengoolie, it's the classic science fiction film that was the first film shot in 3-D for Universal. So be sure to look for the skies when, "It Came From Outer Space" (1953). Next Saturday at 8:00/7:00c on MeTV. Next Saturday on Svengoolie, the doors open once again for the classic monster movie succeeding Dracula that established Universal as the House of Horrors in Hollywood. The film that would launch Boris Karloff to stardom as the king of monsters in Frankenstein (1931). Starting at 8:00/7:00 p.m. central on MeTV. This Saturday on Svengoolie, the full moon is rising and the recently attacked Larry Talbot is now the victim of an unbearable curse. It's Lon Chaney Jr., along with Claude Rains, Bela Lugosi, Maria Ouspenskaya, Evelyn Ankers, and Ralph Bellamy in the legendary horror film classic..."The Wolf Man" (1941). Saturday night at 8:00/7:00 central on MeTV. This week on Svengoolie, it's man vs. machine. Dennis Weaver stars as a salesman that is threatened by a psychotic truck driver in this legendary classic that marked Steven Spielberg's feature film debut. Don't miss Dennis Weaver and the truck driver in the legendary thriller that doesn't involve aliens or sharks, but a "Duel" (1971). Saturday night at 8:00/7:00 central on MeTV. This Saturday on Svengoolie. Don Knotts appears in a haunted house comedy film that combines fright with laughs. It's "The Ghost and Mr. Chicken" (1966). Saturday at 8:00/7:00 central on MeTV. Tomorrow on Svengoolie at 8:00 P.M. is the television movie Ants (1977). I hope that you are not creeped out by this insectoid picture. Catch it on Svengoolie on MeTV. Tomorrow night at 8:00 pm tune in to Svengoolie to watch Tarantula: The Deadly Cargo (1977) on MeTV. Tomorrow night on Svengoolie at 8:00 pm is The Mysterious Island of Beautiful Women (1979) on MeTV. This Saturday on Svengoolie, in a departure from Horror movies, Sven will bring in a bizarre movie that feels like a horror movie that give more kids nightmares in its original release. It's Dr. Seuss' The 5,000 Fingers of Dr. T (1953), Starring: Hans Conreid in the lead role. Saturday at 8:00/7:00 central on MeTV. The Gill Man is back! Svengoolie is presenting the sequel to the Creature from the Black Lagoon (1954). It's the Revenge of the Creature (1955). Saturday at 8:00/7:00 p.m. central on MeTV.